It’s been three days since Russia prevented a terrorist attack on its bases in Syria, with terrorists, as unexpected as it may seem, using sophisticated drones to strike the facilities. Commenting on the issue, Pentagon said that the devices of such kind “could easily be obtained in the open market,” while the Russian Defense Ministry has stated that such technology could be supplied only by an advanced state. While it is still being investigated, where did the terrorists get the technology, this is not the first time they get access to advanced technologies, sometimes entirely by a chance. Sputnik recaps the most resonant cases, when terrorist groups in the Middle East got hold of highly sophisticated weaponry. In October 2017, the Syrian Defense Ministry released a report with footage of ammunition confiscated from numerous terrorist organizations, including Daesh and al-Nusra Front, now named Tahrir al-Sham, claiming that those weapons had been manufactured in the United States or by its close allies. The report outlined that those groups were supplied with “rockets, rifles, machine guns, anti-air weapons and even tanks” allegedly in exchange for oil from the territories. By a cruel twist of fate, those weapons happened to be a part of the routine “arms delivery” by the anti-Daesh coalition to the “moderate opposition”. In August 2017, the Lebanese army, which has been engaged in rooting Daesh out from a northeastern region of Lebanon bordering Syria, discovered anti-aircraft missiles, among other weapons, in an abandoned area. Moreover, the Lebanese, who have apparently done a great job, uncovered surface-to-air missiles left by al-Nusra Front militants in an area captured by Hezbollah and then taken over by the army. As early as 2013, The New York Times reported that Qatar was sending MANPADS (“man-portable air-defense-system”) to Syria and said that these might potentially go straight to Al-Qaeda to shoot down civilian aircraft. Rebel-fighters monitor the sky holding a man-portable air-defence system (MANPADS) in the Syrian village of Teir Maalah, on the northern outskirts of Homs, on April 20, 2016. In 2015, Iraqi security forces lost 2,300 Humvee armored vehicles, supplied by the United States, when the northern city of Mosul collapsed. They were designed as a fast means to carry personnel and supplies to the battlefield, but later Daesh re-purposed them into car bombs with improvised explosive devices. Since then, Humvee car bombs became an integral part of the group’s military tactics due to the weapons’ devastating power and the vehicle’s ability to move fast. In this file photo, Islamic State group militants stand with a captured Iraqi army Humvee at a checkpoint outside Beiji refinery, around 155 miles north of Baghdad, Iraq. 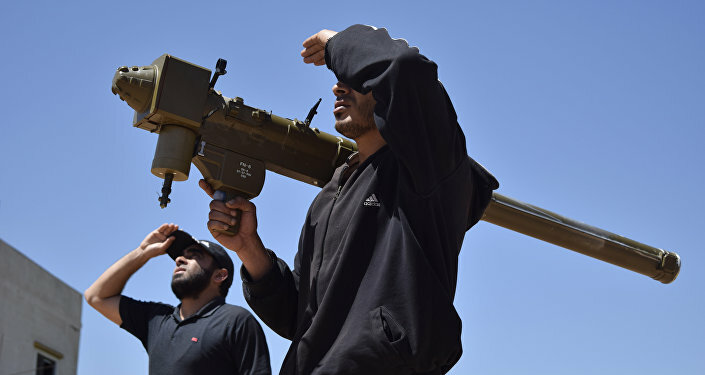 By spring 2014, a year after then-President Barack Obama approved the first direct US military aid to rebel groups in Syria, the US-manufactured BGM-71 TOW anti-tank missiles began to appear in the hands of various anti-Bashar Assad groups. Subsequently, in November 2015, Russian journalists were attacked with the use of those ant-tank missile systems. In October 2014, the Pentagon admitted that due to unforeseen circumstances, one of the airdrops initially intended for Kurds in the besieged Kobani, wound up in the hands of Daesh militants. The group immediately issued a video to boast of the newly-acquired weapons, which were meant to destroy them. Probably everyone who has ever watched videos released by the terrorist group Daesh has noticed that jihadists have been driving Toyota trucks. Certainly, cars are not related to “sophisticated weapons,” but many have wondered how the famous car-maker wound up becoming part of the Daesh “brand”. Well, here’s an explanation: when the US State Department decided to send aid to Syrian rebels, their wish-list, among many other things, included 43 Toyota trucks, which would make it easier for them to move on the ground.